A bit of a row has started between Jay Rosen and Will Saletan for the latter’s attempt to “see how [the torturers] saw what they did” in this post. Frankly, I think Rosen mischaracterizes the problem with Saletan’s post. It’s not so much that Saletan parrots the euphemisms of the torturers. It’s that he accepts what John Rizzo, Michael Hayden, Jose Rodriguez, and Marc Thiessen said — in a presentation with multiple internal contradictions even before you get to the outright demonstrable lies — as the truth. EITs were used to break the will to resist, not to extract information directly. Hayden acknowledged that prisoners might say anything to stop their suffering. (Like the other panelists, he insisted EITs weren’t torture.) That’s why “we never asked anybody anything we didn’t know the answer to, while they were undergoing the enhanced interrogation techniques. Fourth, the right question to ask about the EIT program isn’t whether people lie under torture but whether using torture to train human beings in obedience is wrong despite the payoffs. Doing so ignores how the Bush Administration used torture to get detainees to tell useful lies, the most important of those being that Iraq had ties to Al Qaeda, which is one of the key pieces of “intelligence” that was used to get us into the Iraq War. That lie from Ibn Sheikh al-Libi — extracted through the use of mock burial and waterboarding, the two main forms of torture discussed in the panel — contributed directly to the unnecessary deaths of 4,000 Americans, to say nothing of hundreds of thousands of Iraqis. Here’s the full exchange from which Saletan takes as truthful the assertion that torture is about “learned helplessness” (no one here uses Mitchell and Jessen’s term, but that’s what we know they called it). MR. THIESSEN: Mike, one of the – one of the scenes, you have the interrogator throws the – whoever the detainee is down and starts pouring water over his face and starts shouting, when’s the last time you saw bin Laden? And I think that gets to a deep misunderstanding of how interrogation actually worked. And one of the things you explained to me when I was working on my book and on the president’s speech was that there’s a difference between interrogation and debriefing, and the purpose of interrogation was not – we actually didn’t ask questions that we didn’t know the answers to. It was to ascertain whether they were being truthful or not. (So if you ?) walk through that? MR. HAYDEN: I’m almost willing to make an absolute statement that we never asked anybody anything we didn’t know the answer to while they were undergoing the enhanced interrogation techniques. The techniques were not designed to elicit truth in the moment – which is what was, you know, tell me this or I’ll hurt you more, I’m not your friend – for about a third of our detainees. By the way, for two thirds of our detainees, this wasn’t necessary. Now, I’m willing to admit that the existence of the option may have influenced the two-thirds who said, well, let’s talk, all right? I mean – I mean, let’s be candid with one another. But for about a third, techniques were used not to elicit, again, information in the moment, but to take someone who had come into our custody absolutely defiant and move them into a state or a zone of cooperation, whereby – and then you recall the scene in the movie after the detainee is cleaned up and they’re having this lengthy conversation – for the rest of the detention, and in some cases it’s years – it’s a conversation. It’s a debriefing. It’s going back and forth with the kind of dialogue that you saw in that scene about a – about a third of the way through the movie. As I mentioned the other day, I still haven’t seen the movie, so I’m not sure. But Thiessen’s effort to dismiss the claim that we asked detainees where Osama bin Laden was while being waterboarding may be an effort to rebut Khalid Sheikh Mohammed’s assertion that he lied about OBL’s location to get them to stop waterboarding him — all while hiding the importance of the courier, Abu Ahmed al-Kuwaiti, who would eventually lead to OBL. Now, Hayden’s claim is so obviously false as to be almost pathetic. It’s a claim that Rodriguez — in the very same appearance — undermines, when he describes turning to torture out of sheer ignorance. MR. THIESSEN: Follow-up, Jose. I mean, take us back to – since we’re pulling the broader picture – take us back to September 11 th , 2001. You know, we’ve just been hit – there’s smoke in the ground in New York, buildings have fallen, the Pentagon is broken. And what do we know about al-Qaida? I mean, did we know that KSM was the operational commander of al Qaida or that he had this – or that members of his network – or all this information that we take for granted that we know now? MR. RODRIGUEZ: Yeah, we didn’t know that much. I mean, we didn’t know whether it was Khalid Sheikh Mohammed or Abu Zubaydah who were responsible for 9/11. We had a few assets that provided us some peripheral information, but we didn’t know very much. It took a long time for us to be in a position to really learn what was going on. “We didn’t know all that much,” Rodriguez says. They didn’t even know a key claim on which the legality of the entire torture system depends, that Abu Zubaydah was a senior figure in Al Qaeda (it turns out their assumptions were wrong). If they didn’t know all that much, then how did they ascertain when Abu Zubaydah was telling the truth? And while Rodriguez might say they tortured Zubaydah to make him complacent, after which he told them all that new intelligence, several things belie that claim. First, the number of times CIA and other apologists have claimed they got intelligence — including KSM’s identity — under torture. The fact that the ticking timebomb scenario, which was based on Zubaydah’s claim apparently made under torture that Jose Padilla was plotting to attack the US with a dirty bomb based solely on his searches about uranium, itself justified torture because, its proponents claimed, would elicit the bomb information immediately. Then there’s the way the government chased down every purported attack Zubaydah described, even though those attacks didn’t exist. The CIA acted on the “intelligence” Abu Zubaydah provided under torture. So it’s clear they didn’t know which was intelligence and which false confessions. Moreover, the CIA IG Report very specifically disproves Hayden’s claim that the CIA always knew the answer to questions it asked. Elsewhere in this appearance, Hayden says they should just let the CIA IG Report stand on its merits (while arguing that it draws an invalid conclusion about efficacy because it doesn’t accept that the intelligence gained from torture contributed to the mosaic of intelligence). He’s not going to challenge the factual claims presented by the IG Report. And let’s let that stand on its merits, all right? Let’s not even – let’s not even challenge that. But here’s what the IG Report says about what CIA knew before the torture sessions. [3 lines redacted] When a detainee did not respond to a question posed to him, the assumption at Headquarters was that the detainee was holding back and knew more; consequently, Headquarters recommended resumption of EITs. Even if the pseudo science about “learned helplessness” were valid (there is evidence, even in this presentation, that it’s not), Hayden’s claim is all premised on the assumption that we already know so much about our torture victims that we can test their knowledge. And yet top people at CIA were ordering up more waterboarding based on erroneous assumptions about what Zubaydah did and did not know (it’s worth noting that Rodriguez, and probably Rizzo, would have been in the chain of command in this incident). The main reason CIA embraced torture is because it did not know. It used torture because it (CIA, at least — the FBI did know enough to interrogate without torture) was largely ignorant, meaning it couldn’t use torture as Hayden claims it was used. But something far more troubling happened, in this vacuum of knowledge. Whether it was out of ignorance or malicious intent, the torturers got the detainees to say things they wanted them to say, whether or not they were true. One graphic representation of this came in Abd al Rahim al-Nashiri’s description of the things he lied about under torture. Even assuming Nashiri is lying about some of this, which I’ll grant. If torturers are telling detainees they need to admit to certain information — and then laughing when they do so — it is not a valid exercise of whether the detainee is being truthful or not. And such attempts to get a detainee to tell us what he “should” know have real consequences. Here’s SSCI’s account of what happened when Egyptian torturers, at CIA’s behest and using the mock burial and waterboarding we would subsequently use with Abu Zubaydah, asked Ibn Sheikh al-Libi about something they “knew” he “knew”: that Iraq had ties to Al Qaeda. 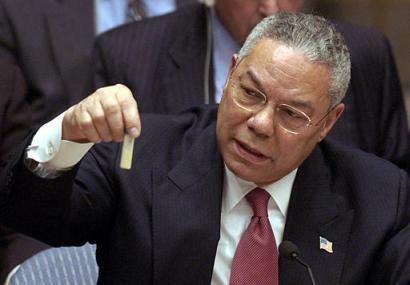 Here’s how al-Libi’s tortured lies appeared when Colin Powell used them to justify the Iraq War, 10 years ago this week. I can trace the story of a senior terrorist operative telling how Iraq provided training in these weapons to al-Qaida. This senior al-Qaida terrorist was responsible for one of al-Qaida’s training camps in Afghanistan. His information comes first-hand from his personal involvement at senior levels of al-Qaida. He says bin Laden and his top deputy in Afghanistan, deceased al-Qaida leader Muhammad Atif (ph), did not believe that al-Qaida labs in Afghanistan were capable enough to manufacture these chemical or biological agents. They needed to go somewhere else. They had to look outside of Afghanistan for help. Where did they go? Where did they look? They went to Iraq. The support that (inaudible) describes included Iraq offering chemical or biological weapons training for two al-Qaida associates beginning in December 2000. He says that a militant known as Abu Abdula Al-Iraqi (ph) had been sent to Iraq several times between 1997 and 2000 for help in acquiring poisons and gases. Abdula Al-Iraqi (ph) characterised the relationship he forged with Iraqi officials as successful. Al-Libi’s lies — lies told to avoid being shoved in a box and beaten, lies that were questioned by DIA just months after he told them and almost a year before Powell used them nevertheless — were one of three or four false claims that led directly to our unnecessary war against Iraq. That’s the problem with Saletan’s attempt to treat the torturers’ claims as good faith (even ignoring the multiple obvious lies and contradictions in their claims). He totally misunderstands the meaning of exploitation. Exploitation — our torture program — was not just about developing intelligence on al Qaeda. It was also either intentionally used to develop propaganda, propaganda that would lead directly to the deaths of 4,000 Americans (the multiple documents used in its development that warned torture would lead to false confessions suggests it was intentional). Or our false beliefs about al Qaeda made it inevitable it would produce propaganda, propaganda that was used to justify an illegal war. Will Saletan imagines that getting detainees to be perfectly obedient might, perhaps, be a “payoff” from torture. But the history of CIA’s torture program shows that that “payoff” came in the form of lies about the enemies we were fighting. With really lethal results. Who are these people? They’re Muslims. One of the most fanatically religious countries on Earth, the USA, is waging a religious war and yet this issue never gets mentioned. I look forward to the day when all this outrage is redirected from discussing symptoms and focuses on the root cause. Noam Chomsky seems the single determined voice prepared to repeatedly point out that religion is the primary issue. Not Muslims, not Jews, not Christians but the delusion that is at the core of all religions. Even people like Glenn Greenwald, while writing lenghty articles about the loss of freedom of speech that religious factions (the Jewish Lobby) are causing, never once uses the word religion to describe the root cause. Can you even see that religion is the issue? @Greg Bean (@GregLBean): Sure, but just generically chalking it up to a still Constitutionally protected activity does little to expose the underlying levers at work. If that isn’t enough to light the fires of religious wrath against communism then I’m not sure what is. One needs to ask, what possibly could be so outrageous about an economic model (communism) that would justify the hatred, and an answer is hard to find. But ask if replacing religion by atheism could do so and one has no problem seeing that religiously zealous countries would wage war in an instance. BTW, I am neither an atheist or communist. I prefer to be more inclusive in the way I think than to pigeon-hole myself by a single dictate. @bmaz: But discussing symptoms is never going to solve the problem. Gun ownership is also Constitutionally protected but is discussed as an issue; not _solely_ hidden behind discussions of symptoms that result from gun ownership. As I said, “religion” is never raised as THE issue. And maybe it is time for change to the Constitution; both about guns and religion. Omniscience is the inherent error made by those who propose, conduct, and support torture. Omniscience only exists in fiction. I find it ironic that Hayden is trying to sell the idea that we didn’t use torture to obtain information, because we already possessed it. That kind of begs the question of why torture would be necessary, then doesn’t it? How many times did we have to listen to breathless morons repeat “ticking time bomb scenario” to justify their desire to inflict cruelty? The whole rationale was that torture was the only possible way to get good information. Um, no. It depresses me that those who sold our national soul to devil aren’t in prison. As an aside, I’ve recently read Hilary Mantel’s books Wolf Hall and Bring Up The Bodies. Torture has not improved in hundreds of years and it is safe to say the results remain just as dubious. Psychologists and others who write about physical or psychological duress frequently object that under sufficient pressure subjects usually yield but that their ability to recall and communicate information accurately is as impaired as the will to resist. This pragmatic objection has somewhat the same validity for a counterintelligence interrogation as for any other. But there is one significant difference. Confession is a necessary prelude to the CI interrogation of a hitherto unresponsive or concealing source. …the use of coercive techniques will rarely or never confuse an interrogatee so completely that he does not know whether his own confession is true or false. He does not need full mastery of all his powers of resistance and discrimination to know whether he is a spy or not. Only subjects who have reached a point where they are under delusions are likely to make false confessions that they believe. From my standpoint, Hayden has admitted the primary point: torture is used to break people down and make them cooperate. In doing so, they are dehumanized into “human books”, much as the prisoners of the Japanese were compared to “logs”. In fact, the history of US connivance on covering up torture goes back to amnestying the torturers in the Japanese Imperial Army. I will soon publish the description of torture techniques given by the Japanese themselves, in a document never before published in the US — never published because the US protected these torturers for their own reasons. But as for everything else Hayden and his spook cohorts say, one cannot believe them. One could start with the lie that the CIA had no assets or sufficient intelligence on Al Qaeda right after 9/11. One would have to believe that the CIA had lost all of the assets they had after conducting the largest covert op in their history, an op that “ended” only 12 years earlier (the backing of jihadists in Afghanistan). Also, what are you talking about re “pseudoscience” regarding ‘learned helplessness”? Perhaps you are talking about Mitchell/Jessen’s use of the term. Otherwise, “learned helplessness”, as much as I think most of the research on it, esp. in the early days, was unethical, is nevertheless science. It is unethical science, and the experimental nature of Mitchell and Jessen’s plan was to find subjects (the detainees) upon which they could “test” the theories of “learned helplessness,” otherwise forbidden by basic human subject protections. They did this by use of doctors and psychologists who monitored the program, made adjustments, and interpreted the data. Finally, as I can see that crap articles get more play than my own work, let me post here a self-referential link to my most recent article that examined a declassified doc that shows how interrogators on-site were fighting out these issues at one JSOC torture facility. It may not directly reference the CIA, but it shows something important that was not mentioned in the Saletan article — that the matter of this torture was hotly debated and opposed within the US government itself, and that whistleblowers were shunted aside when they stood up against the torturers. @Greg Bean (@GregLBean): If it were all about religion, we’d be fighting the Sunni extremist Princes who sit on all the oil, the ones tied to 9/11. And yet they’re among our closest allies. @Jeffrey Kaye: Ha! I suspected you might challenge me on use of that term and wondered whether I should clarify further. By that I mean that one is ever guaranteed to get full compliance. As Rodriguez notes elsewhere, we didn’t get it from KSM. But I get your point about the science backing it. It is real. @Greg Bean (@GregLBean): Religion is NOT the issue. In fact, it is the demagoguery of the imperialists to suggest this. Even in history one must look back and understand that. For instance, there is no historian alive today who would say the English Civil War was merely about differences on religion. @emptywheel: What it also shows is the tension that surrounds the use of the word “science”. There is, of course, the issue of what to included in its nomenclature, i.e., what is “pseudoscience” and what is “real science” (as the disputes over the scientific credentials of psychoanalysis and even Darwinism have shown). But there is a further question of whether we should include grossly unethical forms of inquiry, those that use strictly scientific experimental forms, in the world of science. The most classic examples of this surround use of terrible tortures to derive scientific benefits from horrific human experimentation. Such examples were the frostbite experiments conducted by both the Nazis and the Japanese upon living human subjects in the 1940s. The grossest example is probably the dropping of the atomic bombs on Hiroshima and Nagasaki, which were definitely experiments in the effects of atomic radiation and blast on living human subjects. “The Atomic Victims as Human Guinea Pigs”, posted in part at my blog, with link to the entire essay. Nice remembrance. War in Iraq directly tied to false information supplied by US applied torture. @Jeffrey Kaye: One thing I should have added but didn’t–which you point out here–is how we used and still use these techniques to get people to flip. But at that level even our everyday policing is complicit. Incidentally, I think our allies in the Middle East, whether they be Saudis, Israelis, or (then) Egyptians, were much better at knowing what a torture subject did and did not know. Still not omniscient, but then they never have to invent the excuse that this is largely about intelligence. @emptywheel: According to human rights people I’ve spoken with, getting people to “flip” is what it’s mainly about, at least since ginning up the casus belli for war in Iraq took place. @Jeffrey Kaye: Historically, I think that has always been true. Torture is used to scare people into compliance with the state, saying what the torturers want you to say whether truthful or not. The suggestion that it is useful for gathering intelligence is complete rubbish and always has been. @phred: @phred: If you really wish to get into that controversy, then you must distinguish between strategic and tactical interrogation. The interrogators who push torture in latter, such as JPRA’s Terrence Russell, argue that torture is necessary to break down individuals quickly. But the intel derived is highly suspect. At that level… the field level, if you will… it’s really about terrorizing a population. @Jeffrey Kaye: Controversy is in the eye of the beholder I suppose. But, I will defer to your expertise on this point. My take is strictly a lay person’s view. i can imagine several forms of torture some of which are specifically designed to elicit accurate information others of which are designed to elicit predetermined answers. torturing to terrify a population, on, the other hand, would seem to be a lot of trouble when you can just murder them (mexican drugas) or dissappear them (argentina, sri lanka). the kind of torturing the u.s. did or had done by proxy could be described as “leading questions torture” – torture designed to force desired answers to questions. however, one could imagine a torture designed to elicit specific accurate information,e.g., “who were your accomplices in the attempted assassinatjon of the generalissimo”? here “leading question torture” or torture to frighten a population is not at all the objective. @emptywheel: It’s interesting you can say a religious faction, the Sunnis, are our closest allies but it is not about religion. The point you then make is about economic gain; access to oil. A root issue, but like religion, also never mentioned in your article. I agree with you that it is about economics, but religion is the primary weapon used for economic gain. Religion is a capitalist enterprise afterall – see my post on communism/atheism. So why the endless posts on behavior such as torture and zero focus on religion and its use to justify the theft of what should be shared resources? The focus is like being outraged that team “A” (us and our allies) is illegally tripping team “B” while ignoring the fact that team “A” is depriving team “B” of food, water, air, etc and justifying it because team “A” (we and our allies) believe it’s our right to do so. The focus should be on that deluded belief. While it should also be recognised that the “tripping” is an issue, it is not the primary issue; theft and invasion is the primary issue and until it stops their will be no chance for reconciliation. The delusion of religion is that it perpetuates the idea that ‘we are better than you’. Our God tells us this and as a result we should destroy you and take all for ourselves. As an example, in a recent telemovie by Louis Theroux ( http://en.wikipedia.org/wiki/Ultra_Zionists ) it is made clear that Israel has every intent to take the lands of the Palestinians, would this happen if the Palestinians were a divergent Jewish sect? Not likely. They further state that if the world has a problem with this, tough, they could care less. Israel is using religion for economic gain and believe they have every right to do so. That delusion needs to be rejected in every article that discusses the Israel/Palestine issue, but rarely is. The Sunnis have used their faction of their Muslim religion to achieve economic gain over the Shiites. And believe they have the right to do so. Remove religion from these issues and one finds it hard to justify why one person should benefit more than his neigbor from national assets. @Jeffrey Kaye: Jeff, your comment that, “In the end, these leaders always ended up complying with imperialist diktats, or they were summarily removed (Saddam, Qaddafi, Noreiga, René Schneider, etc. )” is invalid. Saddam and Qaddafi were supported by the imperialists right to the bitter end, long after the population of their own country had rejected them. It is actually quite hilarious that you suggest otherwise. I can hardly wait for you to suggest that once the people of Bahrain and other ME states have won their freedom it will all be because of, rather than in spite of, the rejection of these tyrants by the Imperial US. I’m suprised you didn’t include the US’s good friend, Tunisian dictator Ben Ali, in you list of tyrants ousted by the Imperial US. Well, if you must insist. Seems there is a lot of documentary evidence otherwise. Whose documentary evidence? Imperialists who rewrite history? Jeff, I think you will find that both the Iraqi Kurds and Shia Muslims, the majority of the population, were certainly not in Saddam’s band of defenders. Further, if you think the mighty imperialists rolled in and conquered a country of 25 million+, that fully supported its well armed dictator, in a few hours, one has to wonder why after 10 years they left in defeat. And where did Saddam get all his weaponry? The imperialists. Saddam’s time would have been much shorter without imperialist’s support and they have not replaced him. But, my point, Iraq is still deep in a Shia/Sunni war that would not exist without the religion and it’s divisions. Interference and propping up one religious sect has had an impact but it could not have happened without religion. As to Qaddafi, the rebels were waging war long before the imperialists intervened. Again, where did Qaddafi get his weapons? Mubarak, family friend of imperialists, supported until the bitter end against the majority of Egypts population. But still battling to resist the Muslim Brotherhood; religion again? Ben Ali, been there, but ditto. Bahrain, Yemen, Saudi Arabia, etc, who is arming these countries (imperialists) and who is dying (the Shia citizenry largely) trying to defeat the Sunni dictators? Would this happen without religion? As I’ve said before, the delusion of religion is that the sect believes it has God-given rights rather than equal rights. Addressing that delusion will have an impact. The one (only?) credible CIA statement: “[W]e didn’t know much.” It’s certainly consistent with the agency’s performance over the decades. And it’s an admission that it was ignorance — plus immunity from consequences, plus revenge — not imminence of threat that led to depravity. As for whether torture “works” or provides “payoffs,” it’s a red herring, given that no one really knows. In some instances it may, in others it may not. All we’ve had to date is blowhards — who would instantly bleat about “international law if themselves subjected to this treatment, and who’d never agree to have the issue heard (with them as defendants) in an Article III court — insisting that it does. Easy to say when the facts remain secret. And if it works, what explains US enactment of laws prohibiting it? But here’s the thing… how would you know what info is truthful and what isn’t? You can’t. And that’s the problem. Well, one problem anyway. Torture and maltreatment to recruit snitches and informants. Bradley Manning, Tunisian Americans, Muslims, Jason Schwartz? Just reference the biographies of the “greatest” Israelis of all time poll. Here is number 15. That being said, I disagree with your thesis. And my personal biggest issue is with the capture of the US government as can be seen by my 8 percent student loan rate while my IRA account is earning nothing. Imperialism begins at home. It’s the principle of Divide et impera or Divide and rule. humans are tribal. The ruling class knows how or will learn how to wedge people apart by exploiting differences. It’s political science – applied social science and is older than moses. If not religion, then race, or nationality, clan, sexual orientation, football team or political party. One group can be favored over others causing resentments, and make bad treatment of a minority group legal or PC. Politically we don’t make much progress because with bought Politicians, one hand gives, while the other takes away. Jews are not any different with each other. The dominant sect always tries to force the others to adopt their rituals and views- but if they have a common enemy they will come together in solidarity until that threat is gone (see tacitus on the jews) then it’s back to sectarianism. See the Maccabees, Karaites, Samaritans, the Haskalah vs. Hassidic movement and now… anti-zionist Chabad or Neutra Karta. Did you learn about Blue Eyes-Brown Eyes Experiments in school or college? We are allied with the Saudis, they are fundamentalists, and are always willing to be the pointy tip of the spear- for empire’s sake, because they will be rewarded by being able to sit at the top of the heap. We also used the phalange in Lebanon and caused a civil war there, all based on religion- but the original opposition was non sectarian and opposed to occupation. The groups that I know about that have resisted falling into the trap and maintained or built solidarity are Hezbollah with secular groups, chistians and sunnis, and Hamas (sunni muslim brotherhood off-shoot) with Iran and Hezbolla. I recall something Miguel Littín told me five or six years ago. He had just filmed La tierra prometida in the Ranquil valley, a poor region of Chile. The local peasants were “extras” in the scenes where there were masses. Some of them played themselves. Others played soldiers. The soldiers invaded the valley, and with bloodshed and fire, threw the peasants off the land. The film was the chronicle of the massacre. The problems began on the third day. The peasants who wore uniforms, rode horseback, and shot blanks had become arbitrary, bossy, and violent. After each day of filming, they would harass the other peasants. It really just comes down to the ugly side humanity and self justifications for doing what want to do – but these groups don’t just hate each other, they are taught and manipulated. I am in the moderation closet with the dunce cap on. @shekissesfrogs: Sorry about that, you are freed up now. Probably was the multiple links that got you caught up. And very nicely said too. I think you are spot on as to why it is not necessarily religion per se. Humans are tribalistic in many ways; religion is certainly a big one of them. Greg, how do you propose to eradicate religion? @shekissesfrogs: I am familiar with the Blue Eyes – Brown Eyes experiment and found it quite educational. I was not aware of Charles Davis post but it describes similar outcomes seen by Philip Zimbardo in experiments he ran and discusses in detail in his book, “The Lucifer Effect”. That humans have this orientation is not in question. That someone will try to use it to create a divide they can benefit from is not in question. What I question is the logic of permitting religion unfettered, consitutionally protected rights to perpetrate this. With any other divisive element in our society (you mention race, nationality, clan, sexual orientation, football team or political party) laws have been passed and are continuing to develop to reduce this divisiveness, OR, the element is open to rational debate. Further, they generally are not used to indoctrinate children from birth with divisive beliefs. The unique issue with religion is this indoctrination and inability to question. Just try debating or changing most religious sects beleifs from the inside, as a practitioner, and see how long you can retain your membership, and, with almost no chance of success in altering these controlled dictates. What else in our society is so beyond question? Religion may not be the only element in society behind which a war fervour can be developed but I can find no other that is beyond question. And that makes religion a major issue that will keep us from being a less peaceful society. @John Casper: John, I actually do not see a need to eradicate religion from society, as I said in an earlier post, I’m not an atheist, though I have few what would be seen as religious beliefs I do see value in certain religious mandates, ex. Thou shall not kill. I suggest religion needs to be removed from its pedestal though. 1/ no religious indoctrination of children under the age of 16. Jeff Kaye who has commented on this thread may be better able to elaborate on the psychological damage done by such indoctrination in under-developed minds. It is often described as a form of psychological abuse. If after the age of 16 one wants to dabble in religion, well and good. 2/ hold religions to the standards defined within the Charter of Human Rights. No exceptions. Imagine the outrage if a political party demanded exclsuions from adherence to basic priniples of human rights and yet religions do it as a matter of course. What it is saying is that religion is a higher law than the laws created by humans – we have seen the atrocities that have been done when this is permitted. 3/ recognise religion as a capitalist enterprise and treat it in the same fashion as any other business; taxation, transparency, accountability, etc. Imposing those three actions, as a start, would make a huge difference. I do not feel any of these are outrageous requirements. I would even suggest religious studies be available as part of the education curriculum and might suggest one worthwhile text to base it on would be, “The Evolution of God”, by Robert Wright. The religious people who make up the majority of this country would no doubt beg to differ with you. You talk about “imposing actions” but blithely omit how you would go about such imposing. You “question…the logic of permitting religion unfettered, consitutionally protected rights” but do not address the implications of the converse case, that by denying religion constitutionally-protected rights you must also deny those rights to any other institution; otherwise you can forget about equal protection under the law. In short, you are proposing that religious people simply transform themselves magically into secularists like yourself. Good luck with that. @liberalrob: Yes it is often, maybe always a mistake to be dragged into tactical implementation discussions before agreeing on a strategic direction. When John Caspar asked how, I made a few suggestions and you have now shifted the focus from cause and a strategy to address it to tactics and the issues that will be faced in implementing the strategy; a discussion frought with endless debate that better minds than mine will investigate for many many years; but I have no doubt the cause and strategy are sound and tacticals will be found. Religion is the issue. How to address that is unknown but not impossible. And as often happens, serendipity delivers to the prepared mind, so, no sooner did I make the suggestion that religion is the issue, naming Noam Chomsky in my first post as the respected authority I find most adamant in this argument, than Chomsky delivers me a new supporting argument. “Saudi Arabia is the most extreme fundamentalist state in the world, a radical Islamic state. It has missionary zeal, is spreading radical Islam to Pakistan and funding terror. But it’s the bastion of US and British policy. They’ve consistently supported it against the threat of secular nationalism”, ie, keep it religious or we lose.